This is the shocking moment a teenage motorcyclist is thrown under a moving bus after swerving to avoid a driver who opened his car door while parked at the side of the road. Ryan Selby, 19, suffered a traumatic brain injury and fractures to his back, pelvis and arm after being catapulted into the air on Bohemia Road, Hastings. The silver BMW had been parked at the side of the road, and the teenager lost control of his bike as the driver swung open his door. Ryan ended up underneath the bus, which was travelling at around 15mph at the time on a return journey to the depot, without any passengers on board. However, footage of the collision was captured on a dashcam fitted to the front of his motorbike. Ryan said: “In a way I am lucky as I don’t remember anything about the accident other than what I have been told since. “All I can remember is waking up in hospital with tubes and wires everywhere. “I try not to think about the accident too much but it is difficult not to feel angry at how my life has changed through no fault of my own. As shown in clip, the driver of the BMW attempts to open the car door, but pulls it closed again as a cyclist passes him. But just moments later as Ryan appears behind him, he swings the door fully open, forcing Ryan to brake and swerve. Following the collision, Ryan was rushed to Royal Sussex County Hospital where he spent 11 days in a coma and had to undergo surgery several times for his injuries. He also lost two teeth in the collision, which has left him needing specialist rehabilitation and additional therapy. Ryan was training to be an electrician at the time of the collision on October 11, 2016, but struggled to pass his exams as he couldn’t attend college full-time. He lives at home with parents Mark, 51, and Amanda Selby, 47, and now hopes to start an electrician apprenticeship. Amanda said: “Before the accident Ryan was a lot more independent and outgoing but now because of his fatigue we have to remind him he can’t do everything he wants to. 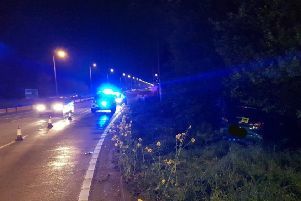 The BMW driver was convicted of a number of motoring offences following the incident, including driving without due care and attention, driving without a licence, taking a vehicle without consent and driving without insurance. He was also banned from driving for 18 months. Ryan is now calling on drivers to adopt the ‘Dutch Reach’ method of getting out of their cars – which involves motorists winding down the window and opening the door from the outside using their left hand. The technique originated in Holland around 50 years ago and remains a required part of the driving test in the Netherlands. It’s hoped the procedure will be added to the UK Highway Code, forcing people to turn their body, increasing their ability to spot passing cars and cyclists. He and his family are also taking legal action against the driver and have already secured an interim payment to help fund his continued rehabilitation. Sarah Griggs, partner and specialist serious injury lawyer at Irwin Mitchell representing the family, said: “While many people with a brain injury may no longer show any physical signs after their initial recovery the effects can last for many years. “Ryan has made tremendous progress to overcome the very serious injuries he suffered. However he still requires specialist therapies to continue his recovery. “His case vividly highlights the devastating consequences that vulnerable road users such as motorcyclists can face because of other road users not paying attention. Road Safety Week runs from November 19 TO 25. This year’s ‘Bike Smart’ theme aims to reduce the number of cyclists and motorcyclists killed or injured on the roads. In 2016 a total of 19,297 motorcyclists and 18,477 cyclists were either killed or injured, according to the most recent figures from the Department for Transport.